I love when I find a great company making innovative products that make life easier for parents. One of my favorites is 4moms. I didn’t have any of their products with my first baby, so when I had a second I knew I wanted to give them a try. 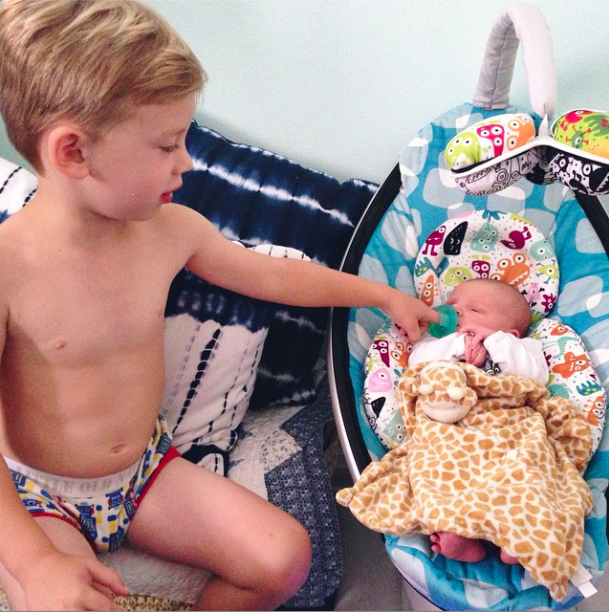 I’ve had the opportunity to use both the mamaRoo and the rockaRoo with Calvin and am a big fan of both of them. 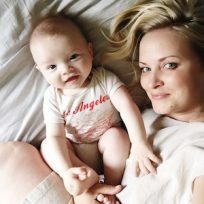 I thought it would be helpful to other parents to share what I like about each one, and what the difference is, in case you are looking to decide between the mamaRoo vs. rockaRoo. The mamaRoo is all about soothing babies. It has five motion settings (car ride is Calvin’s favorite with kangaroo a close second) and five speeds to choose from. It also has a variety of nature and white noise settings, and you can plug your iPhone or MP3 player into it directly. It reclines to different heights, has an infant insert for the littlest babes, and has a mobile with balls that have interesting patterns to entertain baby. Compared to other “bouncers” I’ve tried, the Mamaroo is my favorite. For one thing, unlike the Baby Bjorn bouncer or the Nuna Leaf, the movement doesn’t depend on you. 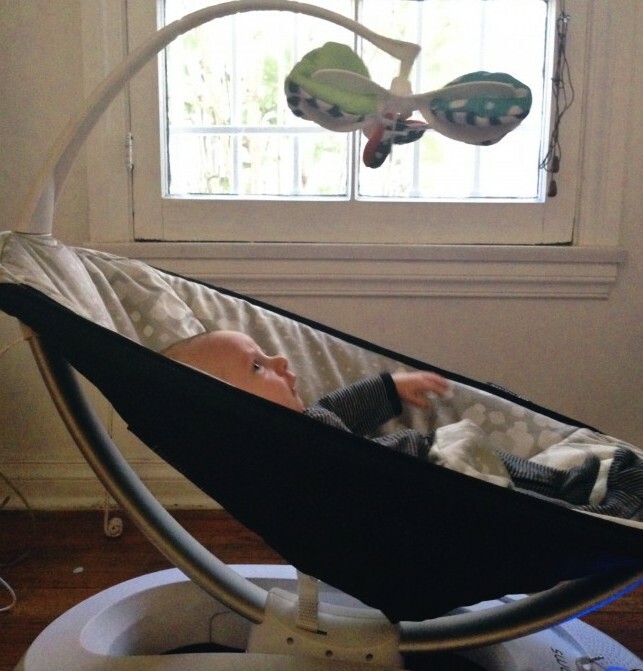 My babies love movement, so for me the Mamaroo works better for our needs. 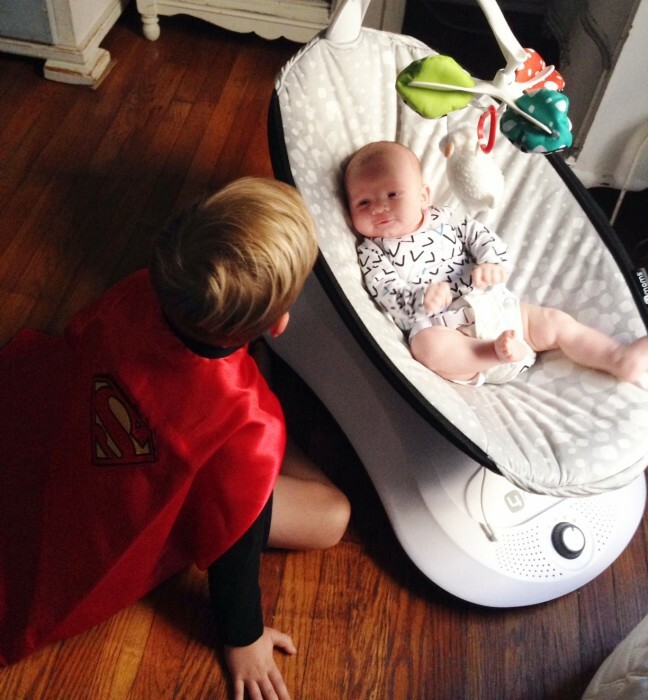 The Mamaroo is a bit larger and bulkier than other bouncers, but is still small enough not to take up too much space. I have heard that the movement it provides doesn’t work for some babies—they are all different and like different things—but mine liked it, and I prefer it to the other bouncer options out there. UPDATE: There is a new mamaRoo in town and it pairs with your iPhone with a free app, so you can control it with your phone. Amazing for when baby is sleeping and you don’t want to risk waking them up with an approach! The rockaRoo is designed to replace a traditional swing, and it definitely does the job. I had a swing with my oldest child, and while it did the trick for a little bit, the cost and the space it took up was so not worth it to me. The rockaRoo rocks like a rocking horse, which maximizes the sensation of rocking and does it much better than a traditional swing. (Their site has a diagram showing how regular swings provide more movement at the baby’s feet, where the rockaRoo provides the motion at their head, which is more soothing to the baby.) It also has a small footprint, taking up 70% less room than a traditional swing. The rockaRoo has the same mobile and MP3 hookup features as the Mamaroo (but no white noise feature). It also has five rocking speeds to fit every baby’s mood. If I could change anything at all about the rockaRoo, it would be to add a simple white noise feature to help when baby is sleeping. Otherwise, I love love love the rockaRoo and think it is pretty much perfect. Calvin loves it too, and and even though he takes regular naps in his crib now rather than in a bouncer or swing, he spends a bit of awake time in it each day giggling at the mobile and giving me a much needed break. What’s the difference between the mamaRoo and the rockaRoo? The two machines do completely different things. While they might seem similar to parents who are shopping for something to soothe their baby while giving the parents some hands-free time, the movement each provides is totally different. Some babies love bouncing, while others love rocking. If you find that your baby loves motion in your arms like bouncing and being swung from side to side, they’ll probably love the mamaRoo. If they love to be rocked or swung back and forth, they’ll likely be into the rockaRoo. I had the mamaRoo first, and Calvin seemed to like it and slept well in it during the first few weeks of his life. But then I was also able to try the rockaRoo, and he loved it. He seems to prefer it to the mamaRoo, so I keep the rockaRoo in our living room for a bit of hands-free time when he isn’t napping, and I keep the mamaRoo in the nursery for when I need a little help in there. And the mamaRoo’s white noise feature is what I use for white noise in his nursery when he is sleeping, whether he’s in the mamaRoo or not. So, if you are wondering which you should get, I can’t really tell you since each baby is different. Both are great products, and my baby likes both a lot. But I will say that the rockaRoo is smaller and replaces a bulkier swing, and I haven’t yet heard of a baby who doesn’t like it. And for the lower price point of around $159.99, I highly recommend it. But the mamaRoo is definitely a life-saver for babies who like that type of movement. And with the newest version allowing you to pair it with your iPhone, it’s sort of the best high tech baby gear there is, in my opinion. If you have either one, chime in and share your experience in the comments! You can buy the mamaRoo here and buy the rockaRoo here if you are interested in trying them for yourself.